I grew up on Vaseline products. Lately on my blog if you've noticed, I've been showcasing products that have been around for quite some time, and are releasing all new updated skin care with fun bright packaging instead of their original signature look. I was so excited to be part of the Vaseline project. I use Vaseline every single day for many different things. My number #1 way I use Vaseline is for taking off my eye makeup, something my mother taught me when I was young. It's a great way to take off heavy, (or light) mascara and shadows without drying out your eye and keeping the moisturize locked in. Vaseline has released 3 new body lotions in all new packaging. Cocoa Radiant, Aloe Fresh and the Total Moisture all meant to keep your skin smooth and soft throughout the day. The formula is non greasy and light, and the smell is light and fresh. •Vaseline® Total Moisture® – Clean feeling lotion for healthy soft skin. •Vaseline® Total Moisture® Aloe Fresh – Light feeling lotion for healthy fresh skin. •Vaseline® Total Moisture® Cocoa Radiant™ – Rich feeling lotion for healthy glowing skin. The lotion is fast absorbing, thick, and leaves my skin feeling like pure silk. Out of the 3, my favorite is the Cocoa Butter. I've been using it non stop, 24/7. After I get out of the shower, before I go to sleep, and I especially like it when I jump out of the pool to keep my skin soft. With Summer coming up my skin has been dry and flaky and my heels have been cracked and blistery. Ew. 1. Exfoliating is a good way to prepare skin for moisturization – it helps to remove dead skin cells from the outer most layer of your skin. 2. Moisturize after your shower or bath to seal in hydration and help prevent dry skin. 5. And don’t forget the recommended shelf life of your products, which for most lotions is two years after they are purchased. Vaseline Total Moisture is available in 3 oz, 10 oz, 20 and 32 ounce bottles, are available at your local drugstore. 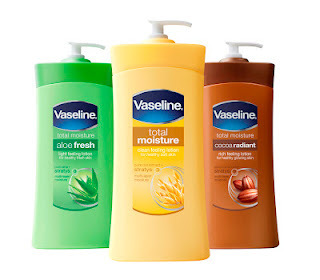 One winner will win all 3 varieties of Vaseline Total Moisture. I'm sure you will love each one! I can't figure out how to enter. Looks like a good prize, though. what a wonderful prize for some lucky person!